A monument commemorates the centenary of the finding of gold at Poverty Point and is dedicated to the memory of pioneer miners of Ballarat. It records gold yields, nuggets and the richest recorded yields of both alluvial and quartz mines. 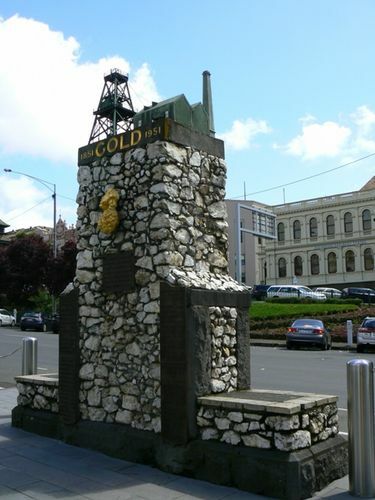 The replica gold nugget on the monument is the `Welcome Nugget`, found in Ballarat in 1858. The nugget weighed 2,217 ounces and was sold for £10,500. Something more ornate than a cairn of Ballarat quartz with inscribed bronze plates is suggested as a memorial to mark Ballarat's gold centenary. It has been proposed that part of the Pioneers' Memorial Fund might be used. This fund was started with £1300 profit from the 1938 centenary celebrations. Age (Melbourne), 16 December 1949.